One group of students attending Bands of America's camp in Bloomington-Normal, Ill., this week got the chance of a lifetime -- the opportunity to hang out, rehearse and perform with the Cavaliers. 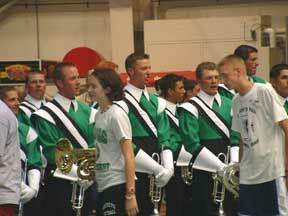 BOA students are welcomed into the Cavaliers' arc Wednesday night in Bloomington. The Green Machine had set up shop in Bloomington-Normal prior to Wednesday's contest. Then on Wednesday afternoon, the BOA Symposium Marching Band rehearsed with the Cavaliers in Hancock Stadium. After the Cavaliers' performance that evening in the field house (the evening's show was moved to standstill status in the field house due to inclement weather), the students in the symposium marching band joined the Cavaliers for a specially orchestrated version of the opener of "Spin Cycle" written for marching band instrumentation.